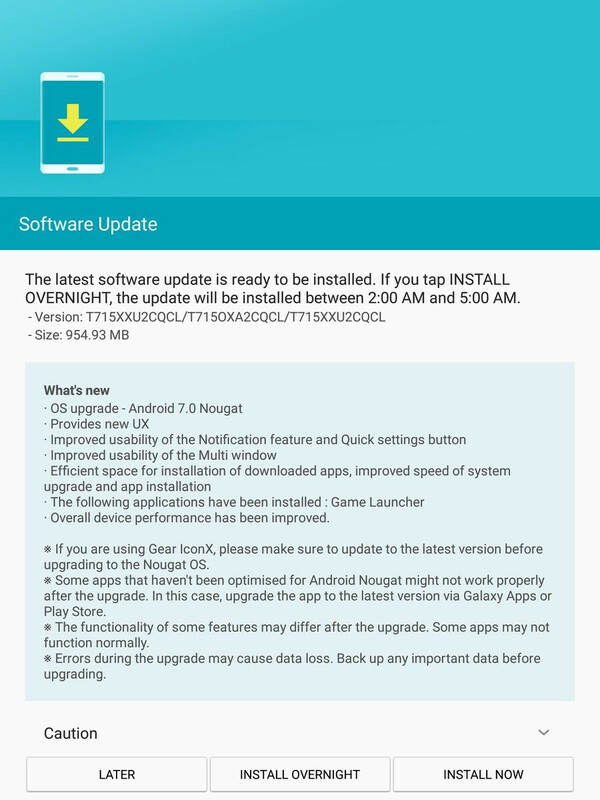 After updating the Galaxy S7 and S7 edge, Samsung has turned its attention to some of its older products that were previously confirmed to receive Android Nougat upgrade throughout the year. We've already reported that some carriers in the United States are now pushing Nougat to other Samsung smartphones like the Galaxy Note 5 and Galaxy S6 edge+. Now it looks like another Samsung device begins getting Nougat updates as well, the Galaxy Tab S2. Both variants of the tablet, the Galaxy Tab S2 8.0 and 9.7 are now eligible for Android Nougat, as many users in Germany and Italy report they have successfully captured the update. Apparently, the first to get it are Wi-Fi only Galaxy Tab S2 9.7 with model number SM-T810, and the LTE-enabled Galaxy Tab S2 8.0 with model number SM-T715. The update adds a new UX to the Galaxy Tab S2 tablets, as well as improved usability of the Notification feature and Quick settings button. The Multi window feature has been enhanced as well, along with the tablet's overall performance. The official changelog mentions the Game Launcher app will be installed after the Nougat update is applied. The speed of system upgrade and app installation should be improved too. I am posses off that my still more than capable Note 10.1 2014 edition has not received even Marshmallow.. makes you wonder why do we need to put down top dollar for such don't care attitude.